Terminal 4 (T4) is Changi Airport’s newest passenger terminal which was opened on 31 October 2017. Built on the site of the former Budget Terminal, T4 is about half the size of Terminal 3 but has a capacity that is two-thirds. T4 will redefine passengers’ travel experience through the Fast and Seamless Travel at Changi (FAST@Changi) concept at check-in, bag-drop, departure immigration and boarding, ensuring a fuss-free and faster departure process. However, if there’s one missing frill in T4, it would be the lack of a common transit mall for arriving and departing passengers, and the Skytrain connectivity to the other terminals. This is replaced with a complimentary 24-hour Intra-Terminal Transfer Bus service between T4 and T2. Follow transfer signs located in the transit areas of T1, T2 and T3 to the “Bus to T4” lounge located at Terminal 2 Gate F51. The Intra-Terminal Transfer Bus service only operates between T4 and T2. If you are coming from T1 or T3, you have to take the Skytrain to T2 first. From T1: Take the Skytrain to T2 from Station D, and take an 8-minute walk to Gate F51. From T3: Take the Skytrain to T2 from Station A, and take a 1-minute walk to Gate F51. If you do not have your onward boarding pass, you should proceed to your respective airline transfer counters at T4. This service is only for transit bookings on the same booking reference (PNR), with baggage checked through from your origin. If you are transferring between flights with different PNRs (eg. Perth to Singapore on Singapore Airlines (Star Alliance) with booking reference LKJHGF and Singapore to Hong Kong on Cathay Pacific (oneworld) with booking reference MNBVCX), you have to clear arrival immigration, collect your baggage from the arrival carousel (if any), and proceed to T4 in the Public Area using the Terminal 4 Free Shuttle Bus Service to check-in again for your next flight. Speak to the counter staff who will issue you a sticker to board the bus to T4. Security clearance will be done at T2 Gate F51 before proceeding onwards to T4. This is due to the centralised security checks at T4 instead of the at-gate screening at T1, T2 and T3. You should ensure that you follow the liquids, aerosols and gels restrictions at this point. After security clearance, head downstairs to the bus lounge. While waiting for the bus to T4, you may use the toilets, fill up your bottles with water since you have already passed through the centralised security screening, charge up your gadgets or simply lounge around on the various types of seats available. The bus to T4 operates at up to 15 minute frequencies between 5.00am to 1.00am, and up to 30 minute frequencies between 1.00am and 5.00am. The journey time between T2 and T4 takes around 15 minutes. You should plan to be at T4 at least 1 hour before your flight departure time. Once in T4, head to the transfer counters to get your onward boarding pass. Once completed, or if you already have your onward boarding pass, head upstairs to the departure transit lounge and proceed to your gate for your flight. Follow transfer signs located in the Arrival Transit Area of T4 to the “Transfer to T1, T2 & T3” lounge located just before immigration. Speak to the counter staff who will issue you a sticker to board the bus to T2. The timetable of the bus to T2. Proceed into the bus lounge. Once the bus is ready for boarding, you will be called. Proceed outside to the bus bay to board the bus to T2. The bus to T2 operates at up to 15 minute frequencies between 5.00am to 1.00am, and up to 30 minute frequencies between 1.00am and 5.00am. The journey time between T4 and T2 takes around 15 minutes. You should plan to be at T2 at least 1 hour before your flight departure time. If you do not have your onward boarding pass, you should proceed to your respective airline transfer counters at their respective terminals in T1, T2 or T3. This service is only for transit bookings on the same booking reference (PNR), with baggage checked through from your origin. If you are transferring between flights with different PNRs (eg. Hong Kong to Singapore on Cathay Pacific (oneworld) with booking reference ASDFGH and Singapore to Perth on Singapore Airlines (Star Alliance) with booking reference ZXCVBN), you have to clear arrival immigration, collect your baggage from the arrival carousel (if any), and proceed to T2 in the Public Area using the Terminal 4 Free Shuttle Bus Service and onwards to T1 or T3 (if required) to check-in again for your next flight. Security clearance will be done at the gate of your departing flight at T1, T2 or T3. You may bring along your liquids, aerosols and gels if you somehow have any after disembarking from your flight at this point, and continue to use them in the common Transit Area of T1, T2 and T3 before you proceed for security screening before boarding your next flight. The Intra-Terminal Transfer Bus service operates between T4 and T2 only. If your flight is departing from T1 or T3, take the Skytrain to access your required terminal. Can i shop at bottega veneta in terminal 3 but my flight is atd terminal 4? Please let me know.. thank you..
Are you transiting from a flight arriving in Terminal 3 and heading onwards to a flight in Terminal 4? If yes, you may. If not, no. I could get from T1 to T4 without a boarding pass from Gate 51 with my intinerary for the onward (Cathay) flight. I could not however enter T4 until I had my Boarding Pass from the transit Cathay Desk, between the bus drop off area & the security section at T4 entramce. Cathay was unstaffed on my arrival at the Desk, but had a contact phone number & they sent a staff member down to Check me in. Good article & great pictures. Far more helpful than the Singapore Airport articles. I am arriving at Changi T4, but I have to pick up a tourist SIM card at Changi T2 UOB Exchange. Will I be allowed to enter T2 and go to UOB Exchange? On landing at Terminal 4 Can I catch the shuttle bus to terminal 2 without going through immigration first? This service is only for transit bookings on the same booking reference (PNR), with baggage checked through from your origin. Why the rule about same PNR ? If my luggage has been booked through to final destination and I have my boarding pass for my Cathay flight, I’m not sure why I would need to go through immigration. If you were transiting from T2 to T3 on different PNR’s, there is no immigration problem. Hi, BusTravel Station is just my personal blog, hence I’ve only included the most direct reason for this transfer since I’m not an official site and I wouldn’t want to be liable for false information. For other possible reasons for this airside transfer, please contact Changi Airport Group (Singapore) Pte. Ltd. at enquiry@changiairport.com or (+65) 6595 6868. Hi. I will be flying using Terminal 4. How do I go to departure transit hall Terminal 2 after I check in at Terminal 4. 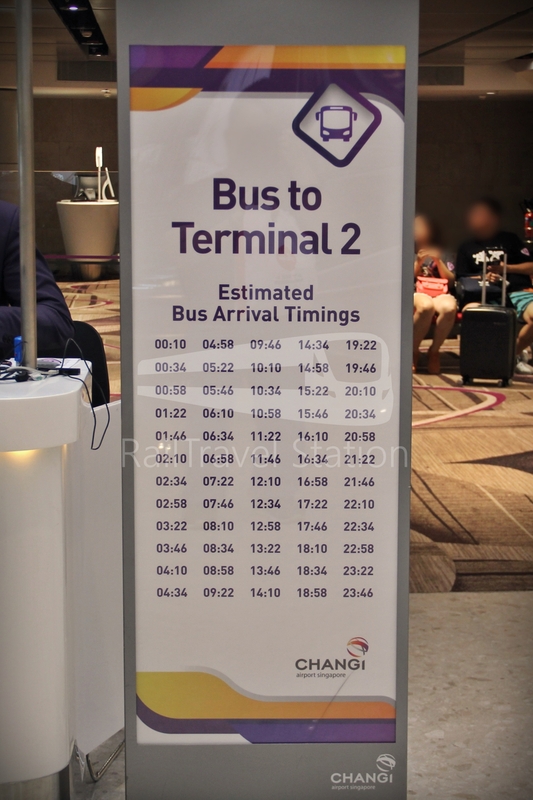 Or I can just check in at Terminal 2 and transfer to departure transit Hall Terminal 4 using shuttle bus through departure transit hall Terminal 2?